There once was a member of the gentry named Hu who had a servant named Erman. One fall, Erman came down with a severe case of the chills and fever. He couldn't do any work, and his master Hu was not keen on the idea of having a sick servant. Therefore, Hu told Erman to leave, he said, ”Erman, we can't employ you any more! You have to leave!” Erman heard and felt sad, he responded to Hu, “But Master, you know I have no family or relatives. Where do you expect me to go?” Hu said ruthlessly, “That's not my problem. If you can't work, you can't eat. How can I keep feeding you for nothing?” Erman pleaded, “I've worked like a horse for you all these years, and I never expected I'd wind up like this! All right, I'll go tell everyone what's happened and see what they said.” Hu thought to himself “If the other servants find out about this, who knows, maybe they'll all refuse to work for me.” Therefore, he told to Erman “Since you're so sick, you ought to find a place to rest and recuperate and come back when you're feeling better. How does that sound? Here is your wages, take it and be off!” There was nothing Erman could do but leave. Erman's symptom worsened by the day . He walked until he sank to the ground and could go no farther. He was starving and dug up some grass with his bare hands to fill his belly. He lay on the ground for seven days and ate all the grass within reach. Surprising, he didn't get worst, but rather felt better and better, finally, he recovered. Erman didn't appear to resent his master, and returned to work for him. Not long afterwards, master Hu's only son came down with the same chills and fever just as Erman did. Hu thought, “None of the doctors have been able to cure my son. How did Erman get better? I have to go ask him!” Hu asked Erman “What kind of medicine did you take to get over your disease?” Erman replied honestly “After I left you, I walked next to a pond outside the village and dropped to the ground. I was hungry and thirsty, and I lived on the grass there to get by.” Erman and Hu went to the place where Erman got the grass. They found that that type of grass was often used by Erman as a brush for kindling. They dug out the whole plant of the grass and give it to Hu's son. Hu's son was cured after eating this grass. That's how the plant got its Chinese name, Chai Hu. “Chai” means firewood or kindling, and “Hu” is the name of Erman's master. 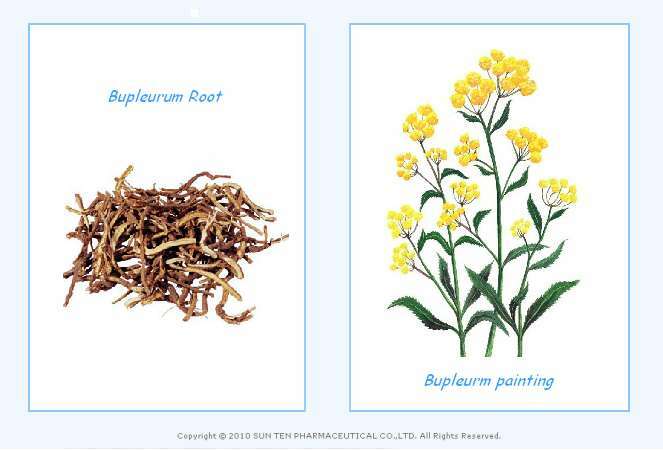 Its English name is Bupleurum or Chinese thoroughwax. Bupleurum root (Chai Hu) is the dried root of Bupleurum Chinese DC. or Bupleurum scorzonerifolium Willd. Is part of Umbelliferae family. It has bitter and cool properties, and with slight aromatic scent and is in bitter taste. It enters through the gallbladder, liver, pericardium and triple burner channels. Contraindicated in cases of Yin deficiency cough or Liver fire ascending to the head. May occasionally cause nausea or vomiting, should this occur, use only a very small dose. The original story is from “Stories About Chinese Herbal Medicine” published by Taiwan Panorama magazine in both Chinese and English.